Yeah, I was shocked, because I never saw people do that before. 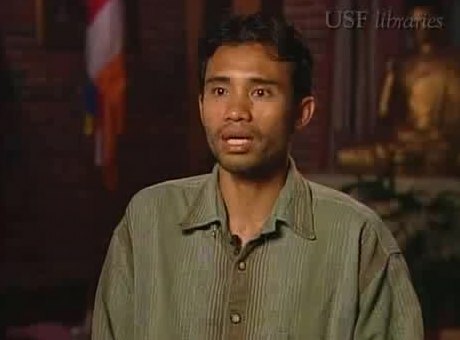 War had started in Cambodia already, but it didn't affect my life at all. I had heard artillery around the city, but it wasn't really affecting me at all. I was a temple boy. I was sent by my mother to go and serve a monk, Buddhist monk, nearby, a temple nearby my house -- you know, in exchange for instruction -- so I was a temple boy. In the temple I never see something like this happen, because in the temple you were taught how to, you know -- with the monk not only teaching how to learn your own culture, and also learn the language, how to read and write my own language, because my family didn't have money to send me to public school. So we would learn discipline; we would learn good intention and loving people and stuff like that. So, I never seen. And in the temple, people are very nice to each other, and always there were music and there was -- every time there's celebration, there was songs and music, the opera and stuff like that, and I never seen stuff like that happen. I was scared to see the Khmer Rouge. Probably they killed the guy. I told my family and they don't believe me. Too bad. They don't take young people seriously in Cambodia; that's one thing I don't like.